In January, I was shooting the Goa Tattoo Festival 2018 for Tattoo Cultr. This was my third convention in Goa, and as always, chilled out AF. There are many reasons to love the tattoo festival in Goa, but more so because it epitomises the most essential characteristic of Goa; the chilling scenes. 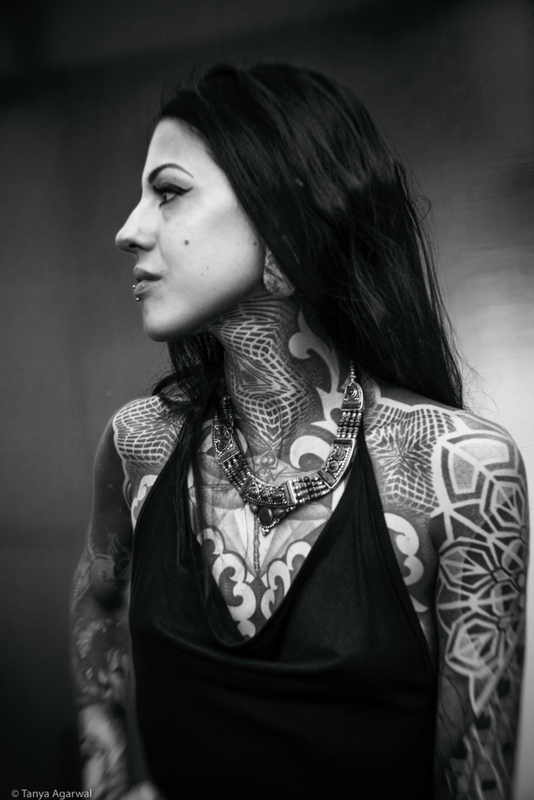 And, you come across some of the finest tattoo artists in the world, from different genres of tattooing. Some truly inspiring people who have chosen their own paths and are leading their lives in the way they want to… And this time round, I was fascinated to cross paths with the stunning Diamante Murru. Tanya (T): How did you get introduced to tattoos in your life? 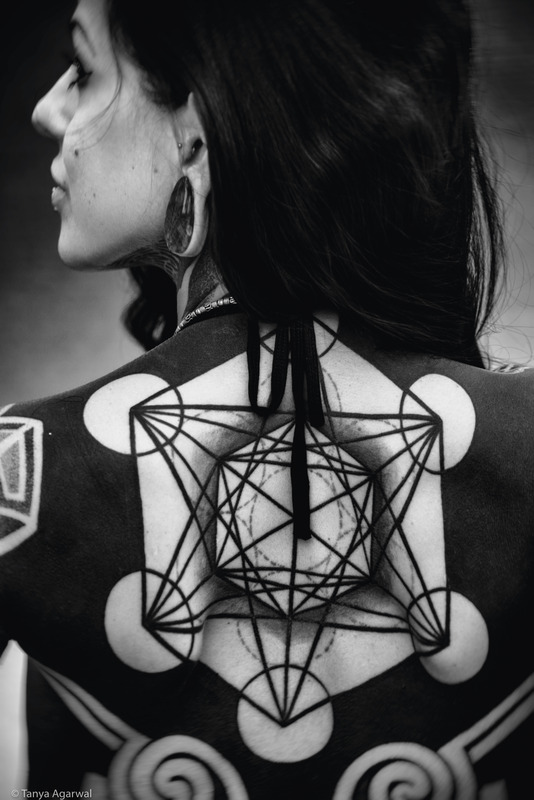 Diamante (D): I’ve always been passionate about body art. When I had started my artistic career, I used to work as a body painter for theatre shows, video-productions, photography. My passion has always been under development and tattooing showed me a different technique to use for the same purpose! 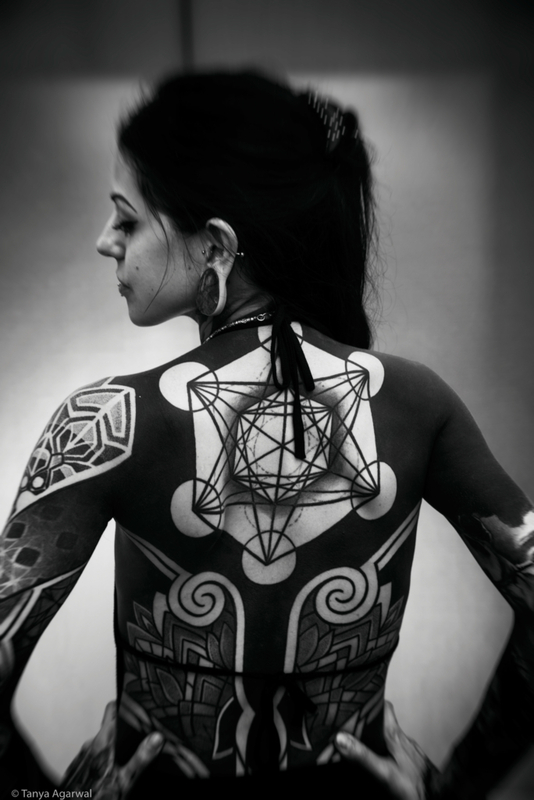 Moreover, tattoos have that mystique rituality which has always fascinated me. T: Between getting tattoos and giving tattoos, which is closer to the heart? D: Both. I can’t choose. I love sharing my art with other people, but at the same time I love seeing my body changing as well. They’re parallel ways of living this type of art. T: Different people get into tattooing for different reasons and goals. What do you desire from this art form? D: I have started tattooing for pure artistic reasons and I love the way I pursue this path. It’s for this reason that I don’t embrace the “commercial” side of the tattoo art and I only realize what I have personally designed, tailored on the customer. Worth mentioning I’m always after positive vibes people, as they act as a great inspiration for my works! If you think about it, tattooing is a pure art exactly as sculpture or painting. Unfortunately, for someone who might not have an artistic background, it is purely a way to earn some “easy money” and that is what may damage those who have invested an entire life pursuing the artistic cause. T: Do you find any form of gender gap in tattoo industry where you come from? D: Not really. Nowadays, this is an industry where the gender gap does not really exist. I might have been lucky to have joined it at the right time and probably in the past women were not taken too much into consideration (and possibly this stopped them from trying it! ), but I can tell you we are all considered at the same level. However, a nice red lips smile sometimes is the reason why we get tips! T: Any favourites among tattoo artists…? D: I don’t have a favorite artist, but a few of them. I admire their techniques, their personality, their uniqueness and their unique designs. T: Any future plans you are working towards? D: At the minute I’d like to stick to my original plan, which is, indeed, my life and life style “on the road”. I love to meet new tattoo artists and share ideas with them, and often these encounters lead to new collaborations. In 2018, I will be working from different tattoos studios in different countries – which is a great way to visit new places and new cultures. Everything is fuel for my art. I will also be spending more time in the art of painting and others: I’ve started developing a project for an exhibition but… I’m not going to reveal anything now! Keep on following me on my social media channels to be updated about my next tattoo sessions locations and dates! Stay tuned guys! And stay…tattooed!